Hello friends, coffee lovers, bloggers and crafters all around the globe! Thanks for stopping by today. I'm sharing a quick little tag I made using some of my cherished October Afternoon papers, stickers, ephemera, etc. The sentiment (#coffee) is from Paper Sweeties as is the sweet little tea pot. I added a few Sweetheart Blossoms here and there, and tied some sweet Cherry Baker's Twine and Teal Baker's Twine on the tag. 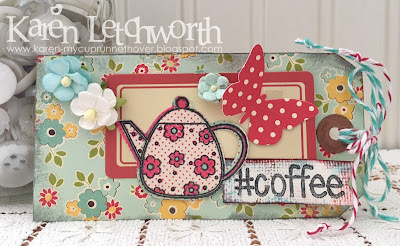 I'm sharing this sweet little tag in the Spring/Summer Coffee Loving Cardmakers Blog Hop. I sure hope that you have been playing along as well. There are so many fabulous prizes out there, so come and play along! Coffee Loving Card Makers Spring/Summer Blog Hop - Anything Caffeinated - Coffee, Tea, etc. Beautiful tag and I love that pretty coffee pot. Your tag is gorgeous, Karen! I love all the elements you used! I would be totally hoarding that October Afternoon collection! Kudos to you for using it! Sweet sweet - love all of the wonderful SPRING colors - you did a fab job laying this out! Karen. Love the double twine on your tag. So pretty with the papers you used. ah yes, I took out my much hoarded October Afternoon papers yesterday...love your sweet tag. Awww!!! What a darling tag!!! Really beautiful!!! Sweet tag. I like the papers and the cute tea pot. Sweet tag. I love Oct. afternoon papers. always so vintage looking. Wonderful looking tag. SO pretty! Love that pretty kettle and butterfly! Karen this is perfect, the gorgeous colours and papers are just beautiful. Love it ! Karen, this tag is very lovely. I love that coffee pot and your patterned papers for sure. Thanks for the inspiration my friend! Blessings to you!